It's a beautiful, sunny winter day–perfect weather for ice skating! 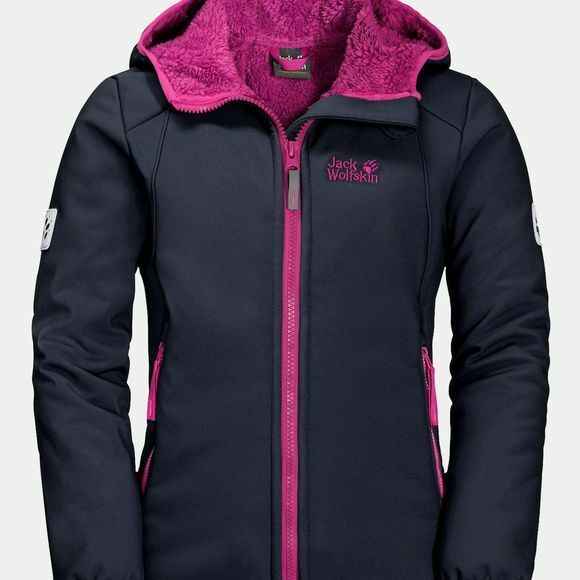 And the Girls Kissekatt Jacket from Jack Wolfskin is the perfect jacket to wear. It provides superb freedom of movement and good protection from the wind and the cold. The jacket is made of Stormlock softshell highloft. This stretchy softshell fabric has a soft feel and is windproof and water resistant. It is also extremely breathable, so if it gets a bit hot and sweaty out on the ice that won't spoil their fun as the moisture can escape through the fabric to the outside. The really special feature of this jacket, however, is the super warm and super cuddly high-loft fleece reverse side. Your little girl will love how it feels. The Kissekat Jacket was developed with help from the Steingässer girls to meet the specific requirements of little outdoor fans. It has a slightly slimmer cut, a simple design and is super comfortable to wear.